William Blake Richmond was Morris’s junior by eight years. He remembered Morris and Edward Burne-Jones being pointed out to him as ‘great oddities’ – even among the Aesthetic set – when visiting his older brother at Oxford in 1854: ‘Little then did I imagine that these two boys would, ere many years, become my dearest friends and honoured acquaintances.’  In 1859, in his capacity as a young corporal with the Artists’ Rifle Corps, Richmond drilled a typically disorderly company of Artist Volunteers: ‘William Morris, for example, invariably turned to the “right” when the order was “left”.’  Years later, Morris successfully promoted Richmond’s application to the Slade professorship in 1879, and the friendship was further strengthened when the Morrises moved to Kelmscott House in 1880, close to the Richmonds in Hammersmith. Some of the most perceptive of all descriptions of Morris are to be found in The Richmond Papers (see Stirling 1926). This is not quite true: the head, set close to the picture plane, conveys the peculiar, brooding energy which is otherwise best captured in some of the photographs. 3) Athenaeum, 20 May 1882, p.641. 4) In the style of Burne-Jones’s ‘Topsy’ drawings; sold Christie’s, 6 Nov. 1995 (111A). 5) ‘[R.B. Staples] called at Kelmscott Manor on the morning of the 10 April 1877. 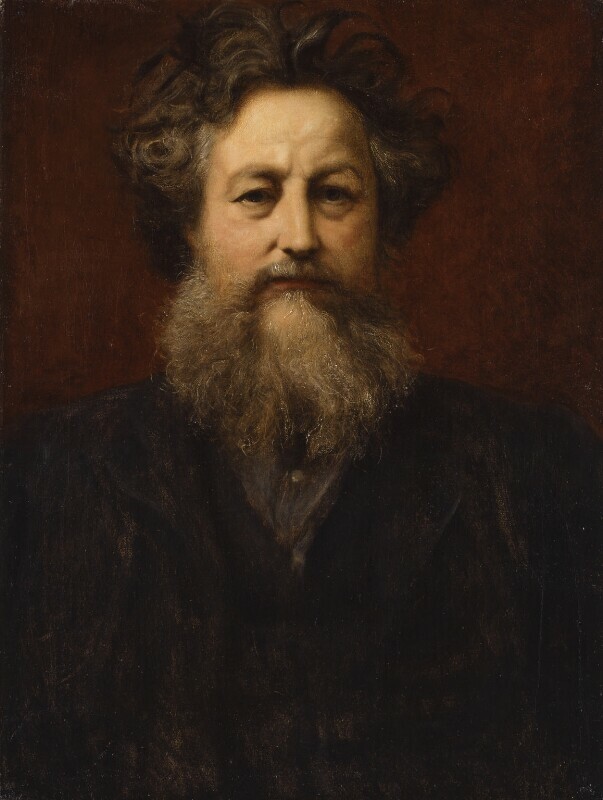 Although happy to talk freely on any topic Staples initially detected ‘a shade of annoyance’ in Morris at being asked to sit for a portrait; he declared, ‘I hate sitting, and the only other recent likeness of me is by [W.B.] Richmond a neighbour of ours.’ McBrinn 2004, p.39. 6) Letter from W. Morris to Jenny Morris, 5 Oct. 1894; Kelvin 1996, p.210. 7) The drawing is untraced; see photograph coll. Hammersmith Public L.; repr. Bradley 1978, p.107 (where attributed to C.F. Murray). See Henderson 1967, p.363; and ‘All known portraits, Posthumous portraits, 1896’. 8) Letter from H.W. Richmond to J.D. Milner, 4 Mar. 1922, NPG RP 1938. For this Richmond, a naval officer, see ODNB. 9) Letter from H.W. Richmond to J.D. Milner, 13 Apr. 1922, NPG RP 1938. 10) Letter from H.W. Richmond to J.D. Milner, 23 Apr. 1923, NPG RP 1938. Half-length, full-face, wearing a dark jacket over his usual grey-blue working shirt, against a red background. The artist, by descent to the artist’s son, Sir Herbert William Richmond, by whom sold to the Gallery, April 1922. Summer Exhibition, Grosvenor Gallery, London, 1882 (114). Victorian Essex, Valence House, Dagenham, 1959 (103). British Genius, Battersea Park, London, 1977 (no number). Stirling 1926, facing p.314 (as collotype).